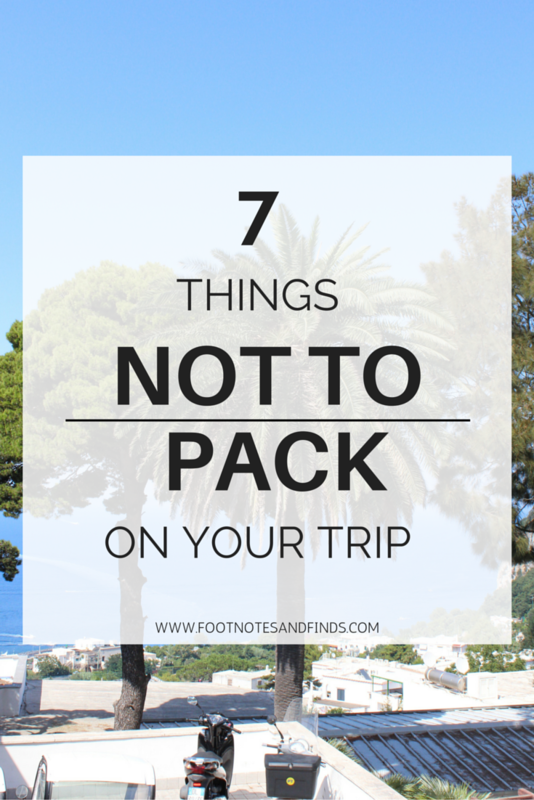 I'm sure we all have been guilty of overpacking at one point or another or all the time! We get stuck with the "what if" thoughts and sometimes try to pack our entire closet into our suitcase just in case we might run into one situation or another. After having travelled A LOT, I have learned my lesson when it comes to this. I have been consciously working on this and so on the last trip I went on, which was to Greece, I was quite satisfied with my packing: a carry-on for 2 and half weeks! And I utilized almost everything I had packed. Travelling usually requires lots of sight seeing and walking so you want to make sure all the shoes you pack are comfortable. You also don't want to be struggling with your luggage whilst in transit, whether it be trains, planes or even ferries, because the less you have the easier it is! This is really an unnecessary thing to pack, especially if you are going to be staying in a hotel. Almost all hotels provide towels for their guests. Towels are bulky and take so much room in a suitcase. So check before hand if you really need to pack that towel. I know we are tempted to take our entire beauty regime with us on our trip, but honestly you only need to pack what you absolutely need! Keep this as basic as possible. You don't need every shade of lipstick and every blush you own. Really think about the ones you most often gravitate towards and bring those. If you have special skincare needs then I understand you need to pack your entire face wash routine otherwise you can purchase travel size for face cleansers and other products or purchase them at your destination. Packing too many beauty products can really weigh a lot and take up room. First off, I highly recommend not carrying real pieces of jewelry on your trip. As for fake or inexpensive jewelry, take as little as possible and do not take any of your favourite jewelry. You don't want to lose your favourite ring or earrings whilst on the trip, believe me it happened to our sister. So I'm guilty of this - I love books. I have a huge bookshelf in my room full of books. But on short trips I bring along my kindle or limit myself to 1 physical book (usually a novel or lonely planet). Here is the thing about physical books such as travel guides, much of it is available online with wonderful travel apps and many of these apps allow you to download travel guides or use the app offline. Yes you have your favourite pair of jeans that you always wear and would love to take with you on the trip. If it is a must then go ahead and pack it, but limit it to that one pair. Denim is heavy! In fact it might just be the most heaviest piece in your luggage. This depends on what type of trip you are taking, but on most trips you really don't need those nice pair of heels or fancy dress shoes for men. The key to travel is comfort. So instead of filling up your luggage with things you might wear once on the trip, save that room for some souvenirs to bring back home. These are good tips! i used to always over pack but not I'm getting better at it. This post was so useful! I'm going on a two-week trip to South America this Summer and I've been trying to figure out how to pack more efficiently. Thanks for these tips! I just came across your blog through SABN and totally loving it. I so agree with all the tips you have mentioned here.